Weddings are such a tricky topic, and every bride has different priorities as well as pressures they feel. Some dream of a giant wedding with all their family and friends, while some would prefer something small and intimate. Maybe you’re feeling like just saying heck with it and heading to the courthouse—totally understandable and there’s nothing wrong with that at all—but if your heart still wants at least some form of non-courthouse ceremony, there are ways to have a beautiful wedding that doesn’t cost a fortune. This isn’t a wedding blog by any means and I’m certainly not an expert on the topic, but I did manage to put together my amazing beach wedding for under 500 bucks (with help from family and friends!) and I don’t regret a thing! Our tiny, intimate beach wedding was an absolute dream. Every wedding is different and I can’t guarantee you’ll be able to spend under 500 dollars like I did, but with a little savvy, planning, and patience, you can save tons of money and still have an unforgettable day. My then-boyfriend, Cole, had gotten a job offer in another state, and we’d been dating for nearly six years at this point. He proposed a week and a half before we had to move, so I planned our wedding in a week and a half. Yep….still pretty crazy when I think about it! I had considered getting married at the courthouse, but I’m eternally grateful that my beautiful sister-in-law (who happens to be a professional wedding photographer!) talked me into having a small ceremony. We got married on a gorgeous beach in Carlsbad, California with my sister, sister- and brother-in-law (who also took photos and video), two adorable nephews, and the minister in attendance. 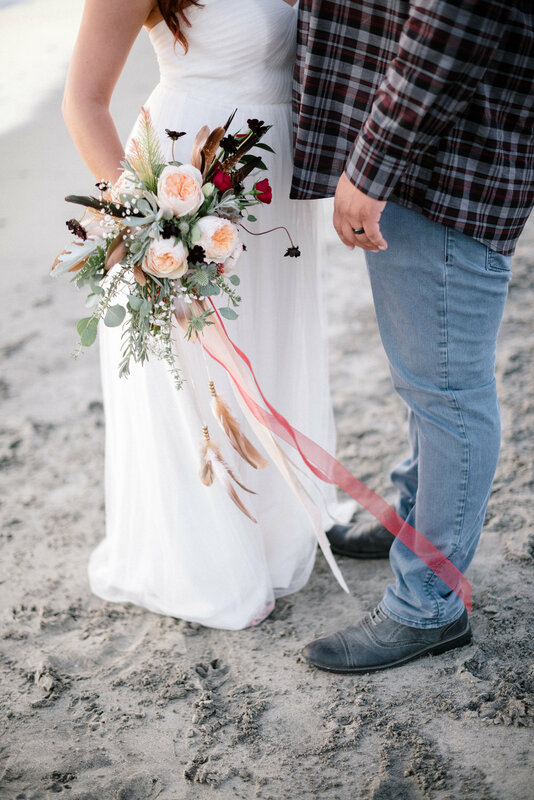 I wore my 30-dollar dress I found at a local boutique and stuck baby’s breath in my simple, loosely curled half updo; my husband wore a simple button-up shirt that matched my bouquet and nice jeans and shoes. We threw an after-party at a local taphouse and eatery, and we had a blast celebrating with close friends. It was simple, a little messy, and absolutely perfect for us. Choose what’s really important to you. Your wedding is your wedding. I know it’s easy to want to please your parents, relatives, and friends, but if you’re feeling pressured to have a huge, inclusive wedding and it’s really not what you want, remember that the decision is yours and no one else’s. Don’t feel pressured to please everyone else in your wedding. Include traditions and elements that are meaningful to you and your fiance, and let go of anything you’re feeling unnecessarily pressured to do. Also, you’ll often find that by focusing on the things that are truly important to you, you can save loads of cash! Don’t throw your money away to fulfill others’ expectations of what your day should be. Buy a bridesmaid’s dress or shop thrift stores, overstock stores, or sales! Bridesmaid dress?! Come again? Yep! I got this AWESOME tip from a stylist at a small wedding boutique. Many bridesmaid’s dresses come in white or cream shades, and since they’re not labeled as “wedding dresses” they are SO MUCH CHEAPER. I ended up buying a stunning, one-shoulder dress with lace detailing for $200. Funny story, I ended up not wearing that dress on my wedding day because I found a dress I liked even more at a local overstock store for $30. You can also save money by shopping dress sales in stores and online, and hunt through overstock or thrift stores too. If you’re willing to do a little digging, you may find something you totally love. Do your own hair and makeup, or recruit a friend to help. Whether you’re beauty savvy or not, YouTube and Pinterest tutorials can be a lifesaver for doing your hair and makeup. Browse Pinterest for inspiration, and practice, practice, practice! I’m no makeup guru by any means, but I’m halfway decent at doing my own hair and makeup. I watched a ton of beauty vloggers’ tutorials on how to do a smokey eye, and it turned out great on the day! However, if you’d prefer some help, have a friend or relative who knows a thing or two about makeup/hair help you. Whether professional or not, most of us know or know of someone who could help. If not, try asking for a recommendation on Facebook. Throw an after-party instead of a reception. If you can’t afford a costly reception that provides food and drinks, invite friends and family to an after-wedding party at a winery, restaurant, brew pub, or a friend’s house! If you can afford to provide some food and/or drinks and you want to, get creative. You could work out a deal where you purchase a certain dollar amount of drinks, then offer drink tickets to guests, and maybe serve simple appetizers. If you can’t afford that, don’t feel guilty. (My husband and I couldn’t!) Just let guests know ahead of time that it’s a buy-your-own-booze party. Let me tell ya, most people will just be happy for the opportunity to celebrate your new marriage with you. Seriously, Pinterest is your best friend when it comes to planning a cheap wedding. Whether you’re looking for decor tips or hair and makeup tutorials, you’ll be able to find LOADS of resources on there. Pin ideas you love to help find ideas to make your day extra special, and there’s plenty of tips on how to find things on a budget too. Seek help on social media. Need someone to do your flowers or help with decorating? Maybe you need some suggestions for venues, photographers, or makeup artists? Post on Facebook what you’re looking for to simplify your search. Odds are that someone among your friends knows a friend or a friend of a friend that can help! When my friend Heather heard of our engagement, she offered to do my bouquet for a great price. 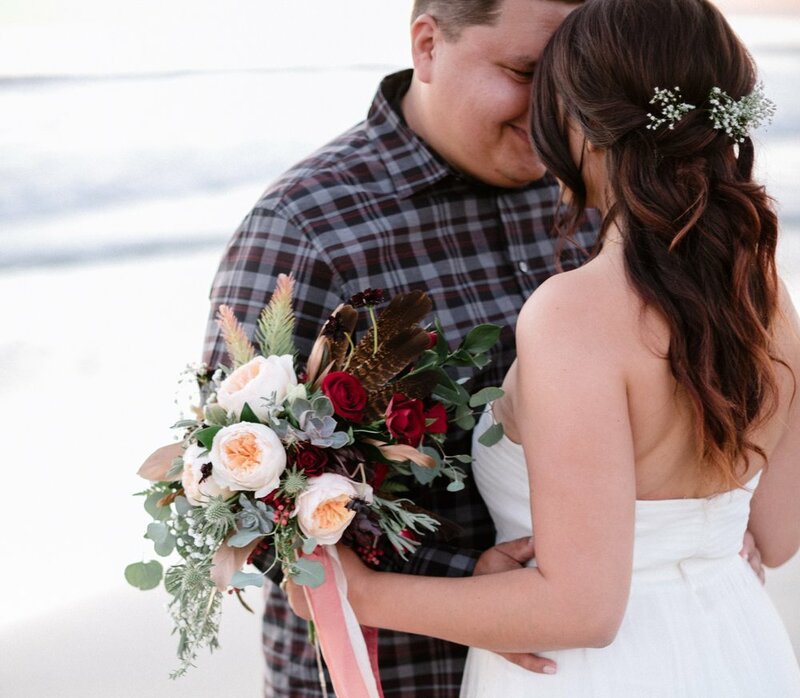 She was building her business as a floral stylist, and oh my gosh, she did an amazing job with my bouquet! See photo in the slideshow above. The point is, if you reach out, you may be able to find someone willing to help you. You’ll never know if you don’t ask! Settle on a photography budget. If there’s one thing I don’t suggest you skimp on, it’s quality photography. You can get crafty with your decor, find a beautiful dress that’s affordable, and learn to do your own hair and makeup, but pictures last a lifetime. Decide how much you want to spend on photography (be realistic!) and then budget for other things accordingly. There are ways to save, for example, if you’re just doing a simple ceremony, inquire with various photographers you like and see if they’ll offer a smaller package. For example, most wedding photographers include 6 or 8 or 10 hours of their time in basic packages; you could ask if they’d be willing to do 2 or 4 hours at a discounted rate. Some photographers offer elopement packages that may fit your needs and your budget. I was incredibly blessed that my sister- and brother-in-law own a photography business. They did an incredible job with our photos. If you’re in the San Diego area, check them out! They’re seriously talented, folks. Research affordable or free venues. You don’t have to pay thousands of dollars for a wedding venue. Parks, beaches, backyards, and churches can be gorgeous, affordable, and maybe even free! Research laws in your area to find out if you need to get any permits or notify any authorities that you’ll be hosting an event. For the beach in Carlsbad, so long as we had fewer than 12 attendees, we didn’t have to pay for a permit to hold our wedding there. I believe the permit was only around 100 dollars, which is still a steal compared to most venues! Get creative, do your research, and pick a spot that is (or will be!) meaningful to both you and your fiance. All photos in this post taken by Walking Eagle Photography. Have any other wedding tips you’d like to share? Leave a comment below!